Another week has gone by and another piece of craft has been completed. Today was my niece Leah’s dedication ceremony. We had a lovely day and it was great seeing all the family together again. I thought about what we could get her as a little present and so I decided on a handmade gift – a stuffed door hanger. I used some gorgeous floral fabric, some magenta felt, lilac ribbon and 2 plum coloured buttons. I cut 2 heart shapes out of the fabric then wrote the name on the felt and cut it out. I used the sewing machine to zigzag round the letters to secure them to the cotton fabric. I then placed the 2 hearts right sides together then sewed round the edge leaving a gap at the top for the stuffing to be inserted. The fabric was then turned out and then stuffed with child friendly stuffing. A strip of ribbon was inserted at the top then the gap hand stitched closed. 2 buttons were sewn on each side to secure the ribbon in place (and to hide the hand stitching). You can make many variations e.g. 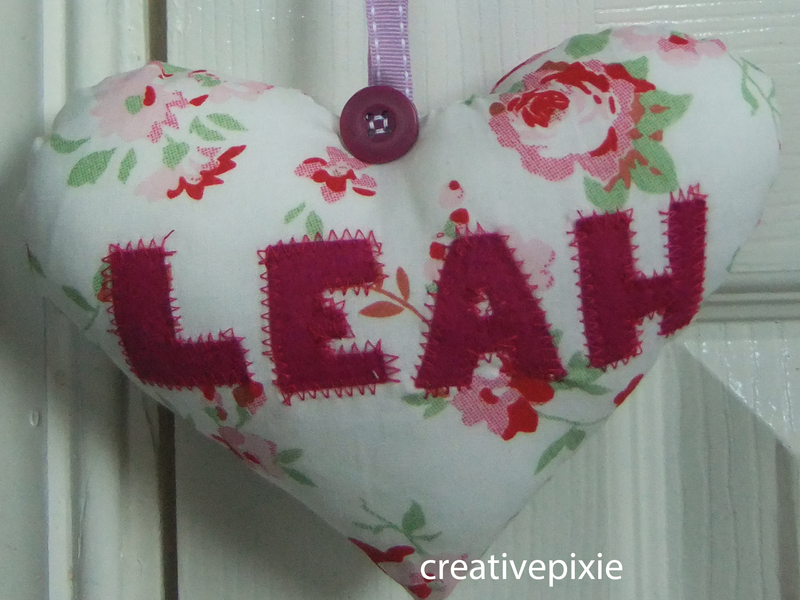 adding a sprig of lavender to make a scented heart or hand stitching the name. 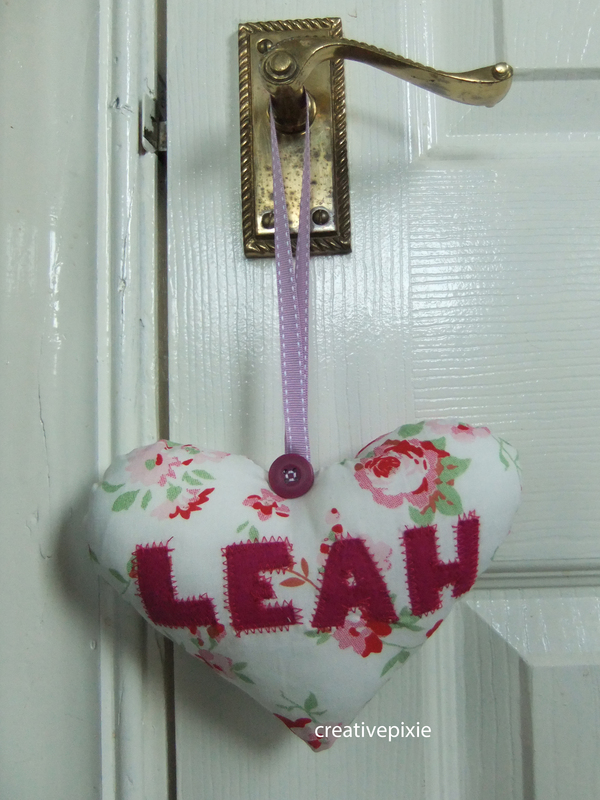 So there you go, something fairly simple to make but quite stylish, I hope little Leah will like it. 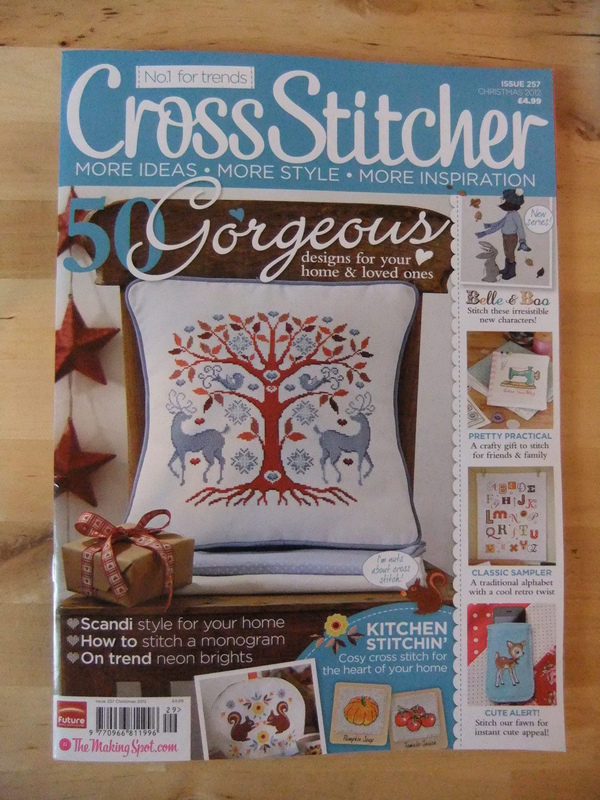 During a recent visit to a supermarket I came across the Christmas issue of Cross Stitcher magazine. I always like to pick up the Christmas issues of craft magazine as they usually have some really lovely pieces to make. So there I was sat on the sofa reading my magazine with a mug of tea and chocolate digestives when my eldest daughter saw a cross stitch and asked me if I’d ‘knit’ it (I know…she’s a bit confused when it comes to all the different crafts Mummy does). Here is the cross stitch she has asked me to do. A beautiful ‘Belle and Boo‘ autumn design. I know Belle and Boo from a childrens book that Poppy has. The illustrations are really nostalgic and look like they hark back to the 1950’s in their style. So I think I’ll order the supplies and try and do that for her for Christmas. Does anyone have any crafting they’ll be doing for Christmas? It seems strange to be talking about Christmas when we’re only just in September but hey crafting takes time! Aww I’m so glad she likes it…makes me very happy. 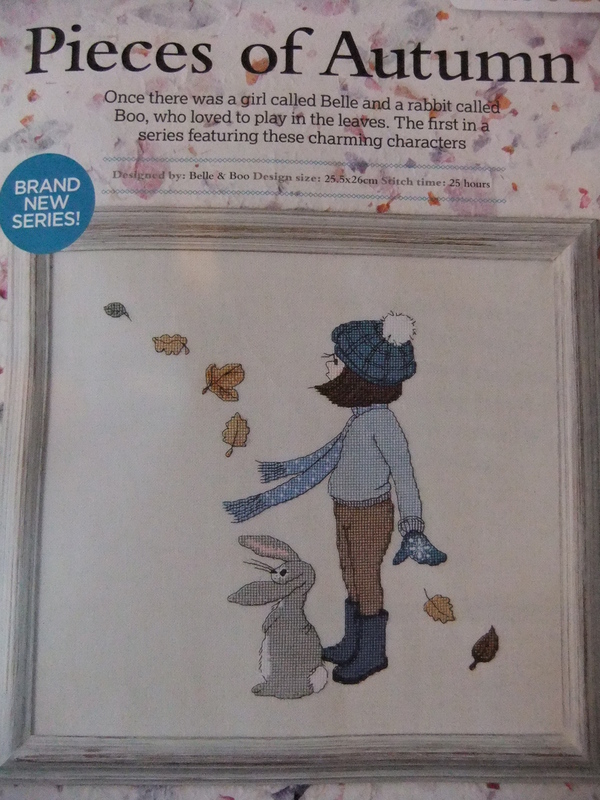 No plans for Christmas but do have some plans for the arrival of my own niece in December, including a cross stitch project and a project involving wooden blocks….Must get hold of that magazine though because I love Belle and Boo stuff too! The end of the article says that cross stitch is the 1st of 4 different Belle+Boo cross stitches coming up over the next 6 months. I was very excited to see which ones they’re doing. It sounds like you’ll be busy with your upcoming projects. I’m considering turning most of the designs in the Scandi chic booklet into my Christmas cards. That booklet is so stylish,I flicked through it thinking I could do so much with those designs as they’re only little so you could do them in an evening. Precisely! I think I could manage one a night too.